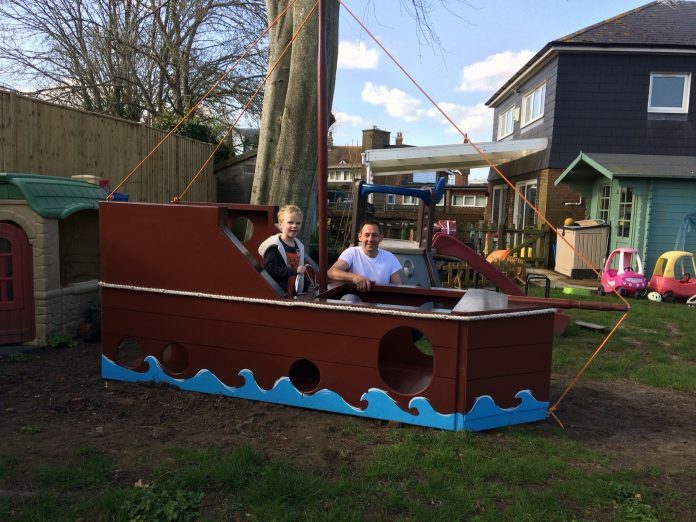 Andi Rivett, a local shipwright, who has run Rock Channel Marine for the past 14 years, was so impressed with the work that the Ferry Road Nursery team did that he offered to build them from scratch a new pirate play-ship for their outside play area. He had helped with their fundraising evening last year to extend their building and learnt that a new play-ship could cost many thousands of pounds. Stamco were able to provide the timber at their charity rate and Andi designed, constructed and painted the ship, complete with mast, rigging, wheel and steps up to the look out. He put all his practical skills together to create the pirate ship for the nursery children to play on. Delivered with the help of local people, he donated the play-ship to them on Sunday, March 24. The first youngster to try it out, pictured, gave it the thumbs up.